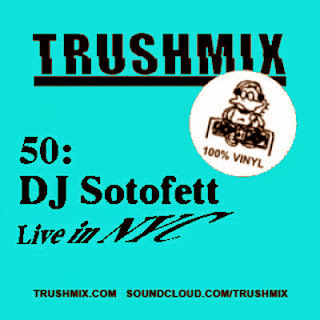 Trushmix 50 present the first 3hrs of DJ Sotofett live at The Panther Room, Brooklyn NYC (Dec. 19th 2013). Amongst the not too unusual Finnish obscurities and unreleased Wania & Mania drops there's a pile of Deep-Queens less-than-$1-digs as well as Jersey & New York City house classics. Shouts to Madteo for hours-upon-hours in the crates and the daily music OD. Thanks to Taimur Agha for setting it all up and also recording the show. In NYC? Don't miss the last Bandwagon show w. Madteo & DJ Sotofett in-store at Halcyon (57 Pearl St. - Dumbo/Brooklyn). Dec. 23rd from 7 - 11 pm. Free and open to all.